My husband and I both value and cherish the traditions we have created over the years with our children. 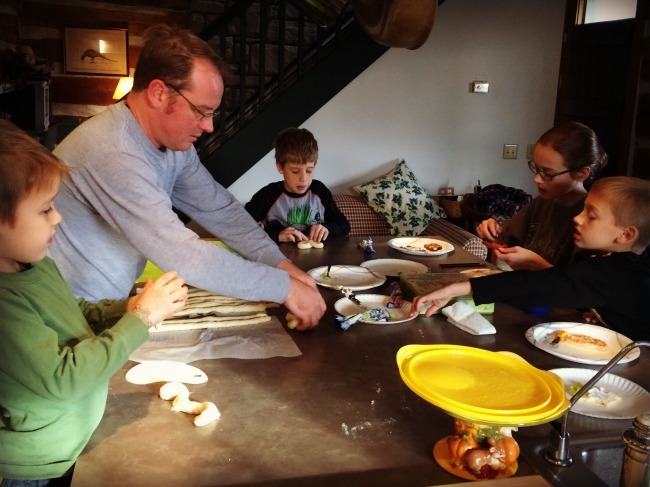 One of our family’s favorite traditions is Homemade Soft Pretzel baking each December while we spend the weekend away at a little cabin in the woods. 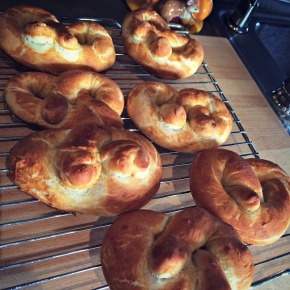 Our homemade soft pretzel recipe came from a cookbook that has been well loved in our house for many years, Artisan Breads Everyday by Peter Reinhart. 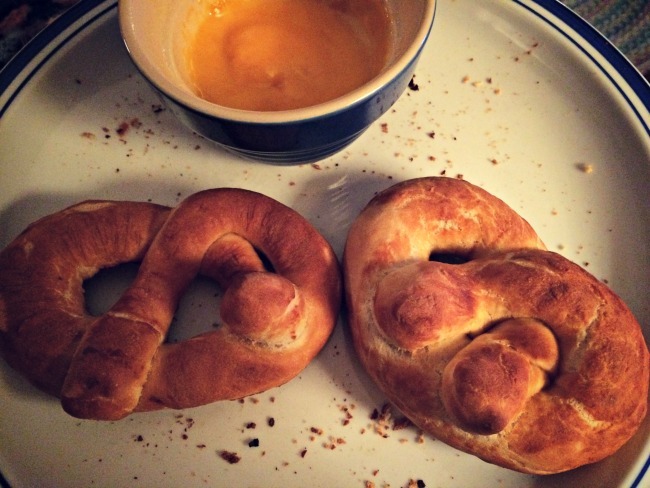 Michael has made many recipes from this book over the years, and the soft pretzel recipe is one we come back to again and again. 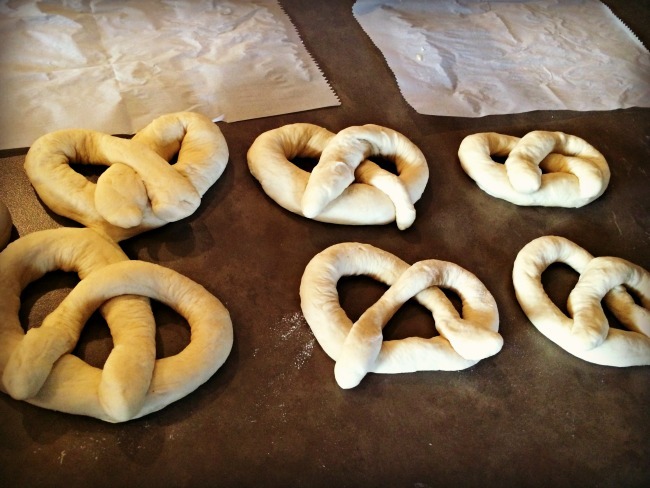 I cannot imagine our trip to the cabin every Christmas without our delicious pretzel baking tradition. I love watching everyone work cooperatively and laugh together. Combine the flour, salt and sugar in a mixing bowl. Whisk the yeast into the lukewarm water until dissolved, then let it sit for 1 minute to hydrate. Pour the yeast mixture and the oil into the dry ingredients. If using a mixer, use the paddle and mix on the lowest speed for 30 to 60 seconds. If mixing by hand, use a large spoon and stir for about 1 minute. A course ball of dough should form. Switch to the dough hook and mix on the lowest speed, or continue mixing by hand, for 2 minutes. The dough will become slightly smoother. Let the dough rest for 5 minutes. Continue to mix with the dough hook on medium-low speed, or mix by hand, for 3 minutes, adjusting the water or flour as needed to form a smooth, firm, but slightly tacky ball of dough. If the dough is very tacky or sticky, add more flour. Transfer the dough to a lightly floured work surface and knead for 1 minute to make any final adjustments. Form the dough into a ball and place it in a clean, lightly oiled bowl. Cover the bowl tightly with plastic wrap and immediately refrigerate overnight or for up to 4 days. (If you plan to bake the dough in batches over different days, you can portion the dough and place it into two or more oiled bowls at this stage). To make the dipping solution, stir the baking soda into the warm water. Whisk in the optional egg white (this will add a little shine, but it’s optional). Preheat the oven to 400˚. Pour the baking soda solution into a shallow bowl or small pan. Remove the dough from the refrigerator and immediately divide it into 2-ounce pieces or 3-ounce pieces if you prefer larger pretzels. 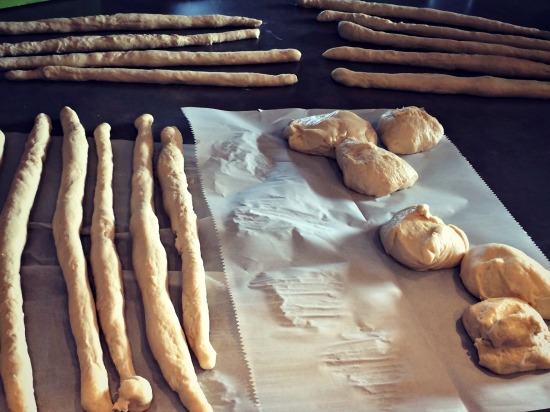 Roll each piece into a rope about 17 inches long, tapered at the last 3 inches of each end (if the rope shrinks back after rolling, proceed to the next piece and return a few minutes later, after the gluten has relaxed, and roll the rope again to full length). Line a sheet pan with parchment paper or a silicone mat. If parchment, mist it with spray oil to prevent sticking. 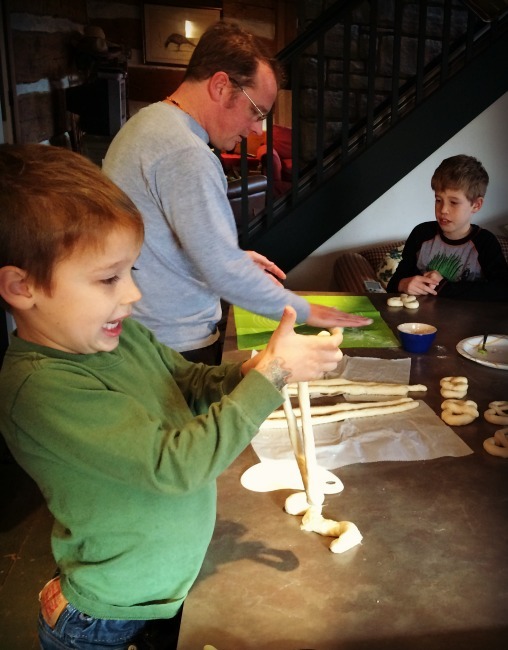 Form each piece of dough into a pretzel shape, then place it on the sheet pan. As soon as the pan is filled, carefully dip each pretzel into the baking soda solution to thoroughly coat it, then put it back on the pan. Sprinkle on salt to taste, but be aware that a little goes a long way. Dip and pan all of the pretzels. Bake for about 8 minutes, then rotate the pan and bake for another 8-10 minutes, until the pretzels are a rich brown. Transfer the pretzels to a wire rack and cool for at least 10 minutes before serving.